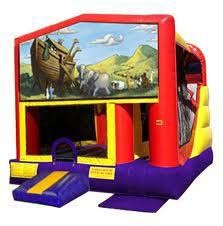 Skip over those averageMoon Bounces and go for something that ALL the kids will really enjoy. Our 5 in 1 Obstacle Course Combo not only has a Jumping Area but it also has an Obstacle Course, Basketball Goal, Climbing Area and 13' Slide! Kids cannot get enough of this one! You can get the prize for being the "Coolest Parent" by having our Happy Birthday 5 in 1 Obstacle Course Combo at your next party. Add in a sno-cone machine and your backyard party is complete for a hot day! Ask about our birthday party specials!